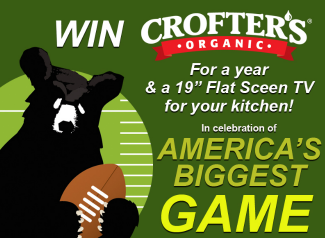 Crofter’s Organic America’s Biggest Game Giveaway – Win a Flatscreen TV & more! Win Crofter’s Organic products for a year & a 19″ Flatscreen TV! ENTER SWEEPSTAKES HERE – Crofter’s Organic Facebook page. ENTRY LIMIT – One entry per person, not including bonus entries. 1 Bonus entry will be awarded to any entrant that posts a photo of of their game face to Facebook, Instagram or Twitter with the tag #CroftersGameFace. 1 bonus entry per photo posted. ELIGIBILITY – This Giveaway is open to all legal residents of the United States of America and Canada who are 18 years of age or older at the time of entering the giveaway. SWEEPSTAKES ENTRY PERIOD – The giveaway will open January 22, 2016 at 8:30am PST and will end February 7, 2016 at 11:59pm PST.